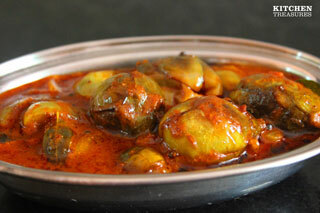 Ennai Kathirikkai kuzhambu is spicy, aromatic, flavorful and lip smacking dish. Mix the Kathirikkai kuzhambu with rice or have as side dish for any Indian Bread varieties. Heat oil in a heavy bottomed pan and fry the brinjals to golden brown. Take the fried Brinjals out leaving behind the oil in the pan. In the oil left out in the pan, do the seasoning with mustard, fennel, fenugreek and curry leaves. After they splutter add in onions, garlic and tomatoes. Fry till the tomatoes become soft. Throw in the salt, turmeric powder and sambar powder. Stir for few seconds. Pour in the tamarind extract. When it starts boiling, drop in the fried brinjals into the pan. Add the jaggery too. Allow them to boil till the oil separates. Finally add the fenugreek powder and switch off.